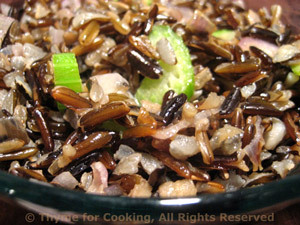 Wild Rice, Onions and Celery, Thyme for Cooking easy sides. It's called 'rice' but it is really a grass. It has a wonderfully, nutty taste that goes well with roasted meats and flavorful sauces. Rinse rice and put into a small saucepan. Add stock, water and bring to boil. Cover, reduce heat and simmer for 40 - 45 minutes. Check your package for proper directions and proportions - it may vary. Cooking time will vary according to freshness of rice, altitude, whatever. Simmer until tender. We prefer to have most of the kernels "popped". In same pan, heat butter. Add onion, celery and sauté until tender, 5 - 8 minutes. Add rice and stir well to combine and heat through. Add Sherry or Madeira, stir and serve.